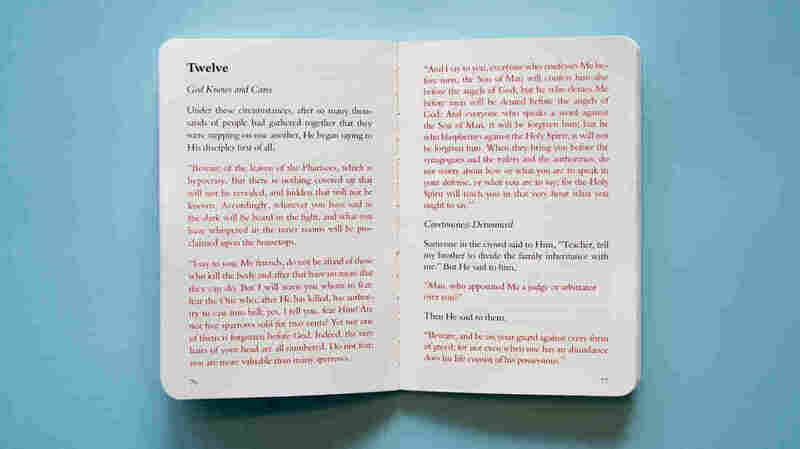 'Manuscripts' Encourages Readers To Approach The Bible Like A Novel The Bible's famous verse and chapter structure is relatively recent — and surprisingly unpopular. And a new version out now aims to make it more approachable by structuring it like any other book. The Manuscripts version of the Bible abandons chapter and verse structure, encouraging readers to approach it like a novel. The first Bible I ever purchased was a New International Version Student Life Bible; it was black with neon pink and green lettering. I picked it up from the bookstore of a church I was invited to in my late teens. This "expanded" version featured maps, reading plans, and questionnaires geared toward teenagers who wanted to learn how to effectively apply biblical principles to their daily lives. In other words, how to learn to be the "salt of the earth." While the environment was certainly foreign to me at the time, what kept me coming back to the youth group were the words: The scriptures, with their psalms and lyrical exhortations, tugged at a wayward misfit who had an affinity for poetry and vivid prose. Since then, I've owned dozens of Bibles in various translations and languages. You don't have to look hard to notice the Bible has been marketed to fit nearly every person and interest. There are editions dedicated specifically for men, women, toddlers, athletes, military wives, and people in Twelve-Step recovery programs — each edition emphasizing relevant passages and often featuring commentary from religious scholars or well-known personalities. Sometimes they're a bit much — the Patriot's Bible, for one, is a damn shame that wears its racism and twisted view of patriotism on its proverbial sleeves — but other times they succeed in helping bring the text to life. But they all have something in common: Nearly every Bible I've ever come across, with a few exceptions — the ESV Reader's Bible, for example, which presents scripture as one extended storyline — has functioned as a kind of reference book. The numbered-verse structure, a relatively recent convention, has had its fair share of critics for centuries: Ancient manuscripts didn't contain these divisions that have become so familiar to modern readers. But there's also been a surge of interest in engaging with the Bible in the same way you would a novel, free of footnotes and asides. 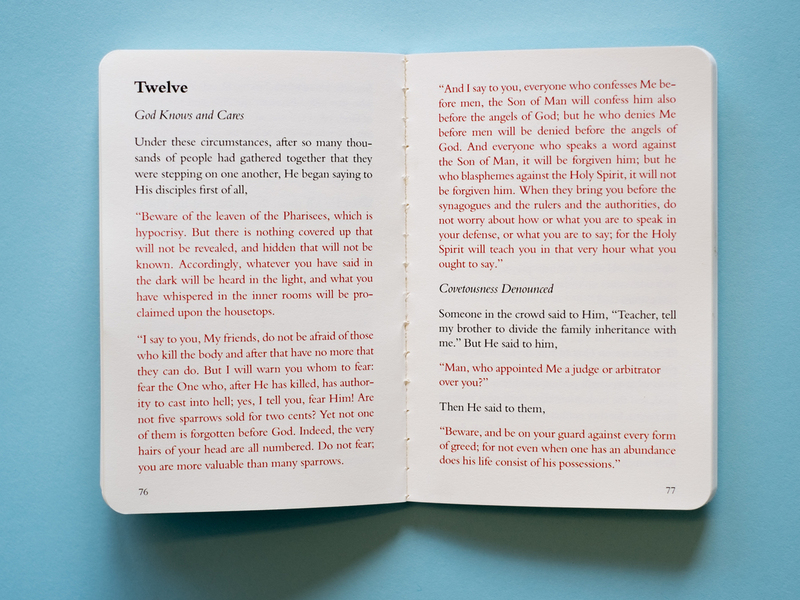 That's the approach taken by the small team behind Manuscripts, a new version of the Bible in the form of individual pocket-sized volumes — the first of which are coming out this month after a successful crowdfunding campaign. "Our research showed us that people were often intimidated by how it's traditionally been presented; as one big book," says Manuscripts creative director Jacob Scowden. "We wanted to give an ease to it, and reemphasize the effectiveness of reading the Bible as individual books." Manuscripts is beginning with the Gospels — Matthew, Mark, Luke, and John — a spiritual biography of sorts chronicling Jesus's life, teachings, and ministry. In their version, each section of text is arranged in a single column, devoid of verse numbers and footnotes, so it reads less like a textbook. While having passages broken down into manageable chunks can prove useful in certain contexts, it can also make it harder to figure out the author's original intent. (And though the Bible's authorship, and authorial intent for that matter, brings its own set of questions, it's still an argument worth noting.) But who still reads the Bible, anyway? And who might benefit from something like what Manuscripts offers? A 2017 survey by the Christian research firm (and bookstore chain) LifeWay showed that 1 in 5 Americans have read the entire Bible at least once, with 9 percent claiming to have read it through multiple times. Although the content remains familiar and unchanged, it feels, somewhat surprisingly, like I've discovered something new. As I skim through the pages of the Manuscripts book of Luke, I can't help but wonder if those numbers would climb considerably, just on the basis of its simplicity. It's easy to read and functions, to my mind, like a piece of literature. Plus, it's much easier to engage with than that first Bible I got from the church bookstore all those years ago. Jon Hernandez, a friend and executive minister at Concord First Assembly in North Carolina, tells me Manuscripts could be a useful tool to help expand the Bible's readership, especially among millennials. "For a generation consuming information in 140 characters or less, anything that can make the scriptures more approachable is welcomed." He has a point. As someone who has read the Bible for years and yet always found its presentation daunting, this is something I didn't know I wanted. Something I can breeze through in minutes and yet still feel enriched by the text. Although the content remains familiar and unchanged, it feels, somewhat surprisingly, like I've discovered something new.